1947: Reconstruction of the factory with the war indemnities. 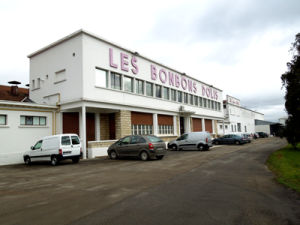 1981: The Bonduelle family bought the factory. 1984: The company Dolis acquires the Kemmel chocolate factory based in Bourbourg (59) and in Metz (57). 1988: The Dolis and Moulin d’Or (ex Kemmel) companies are purchased by the CEMOI CANTALOU group. 1993: Plant closing in Metz and transfer of the Marshmallows unit to Saint-Florentin (89). 2005: The Dolis company integrates the SUCRALLIANCE Group, specializing in confectionery. 2010: First certification for the ORGANIC Production. Hard drop and filled candies : Fruit candies, mint, menthol, honey, caramel, praline candies, licorice, organic candies. 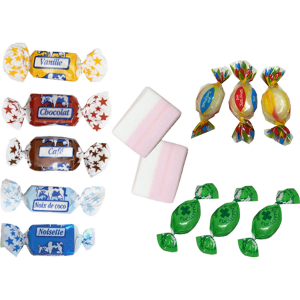 Chewy candies : soft chewy candies, soft caramels, soft sugar free. Marshmallows: cube shapes, two colors and cylinders. Dolis is a leading manufacturer of private label products.